First off, though, RTGs make noise. It’s a fact, as it is true, more or less, for all rotating machinery. Like people, some noise is just more pleasing, more interesting, and overall more fun to be around. Take music, for example. In regards to nature sounds, you’d be hard-pressed to read a novel and not find a reference to some specific nerve-calming sound derived from the wind. Wind sounds seem a nice part of the human experience. Except perhaps for Hilda. With a slightly increased beat of my heart, still, even after 25 years, I recall with a strange fondness when I was secretly in love with Hateful Hilda the Widowed Waitress. It was rumored her husband had died of the bloody flux. I met her at the Moose Lip Café where she was doling out late-night food and coffee, some free advice, and psychiatric amendments to anyone in need, even those not in need. She was widowed way too young and it seemed to have an ill effect on her disposition. But Hateful Hilda was a good listener. One ear was much bigger than the other so she couldn’t help hearing from that side even if she didn’t want to. I suppose, because of that ailment, nothing was ever in harmony for her. She once flat out told me she hated music. All music. Gasp! My best guess is that H.H., hardy as she was, would NOT be a very good candidate for a roof-top wind generator. But she was one-of-a-kind! Alas, she married again shortly after I met her… to someone else, and moved away. Wind gennys, as they are affectionately known, are dynamic. I think that’s why we like them so much. You can watch them work; hear them sing. They transform seamlessly from a whisper to a song, to a whine and a howl. And they will do it all day, all night whenever the wind asks. To me, it’s the sound of electrons filling a bank of batteries for later use. What I previously had to purchase from a soot-belching, highly impersonal conglomerate, one adept at splitting apart unnaturally high concentrations of already unstable nuclei, now comes my way on the wind along with a song…without cancer, without radiation, and most noticeably, without a monthly bill. If I don’t listen to the song, it rewards me with electrons and a symphony anyway. Over the course of several years, I installed two Southwest Windpower Air-X 400 watt wind turbines and a Mallard 800 watt wind generator on my small homestead using a roof-top mounting instead of towers. The two Air-X’s have a 46-inch rotor and come to life when the wind speed reaches 7 mph. The third wind generator, the odd ball, the Mallard 800E, lies dormant until 9-10 mph. It has a 5-foot rotor with 6 blades. Plenty of torque but it seems to lack in power over most of the wind spectrum prevalent here, (but read on)! At 7 to 10 mph, the Air-X gennys spring to life. With a barely audible, low-pitched, bearing-rumble, sounding more like Elvis starting up Blue Christmas at 33-1/3. The rotors turn ever-so-slowly, almost begrudgingly. If you listen closely, a slight whoosh of air can be heard, although it’s usually drowned out by the other sounds of life in and around the house. At this slow speed, each rev of the rotor can be discerned and matched with a spot in the air, perhaps corresponding to a relative flat spot on a ball in the bearing. It’s more noticeable if I’m up in the loft or outside but hardly so in the living quarters. No power is generated at the lower end of this regime as the output of the alternator is way below the 12 volts of my battery bank. A not-so-convenient red LED light is positioned on the underbelly of the Air-X that illuminates when the output exceeds the battery voltage and the unit starts charging. Depending on the state of the batteries, as the wind speed increases to around 10 mph, the LED comes on and the Air-X’s begin to feed the batteries a breakfast of electrons…and the fun begins. Suddenly, my thoughts are interrupted. On the other side of the house, the east side genny kicks in, and now there’s two part harmony adding dimension and flavor to a freshly nucleated symphony of wind. The Mallard, the bigger brother, wakes up sluggishly around 9-10 mph. Noticeably absent is the bearing rumble sound, for he seems to be built of stronger stuff. Quieter as well. The Mallard’s slower rotational speed results in a lower-frequency, lower-pitched air whoosh that adds depth and bottom-end to the slowly growing wind song. However, at this stage of the game, it is positioned too far away from the symphony to play a major role. Everything at this wind speed is slow, soft, leisurely. The low wind speed fails to keep the rotors moving for any length of time so the music is inconsistently punctuated with lots of empty space. Interesting, but it leaves you asking “Is that all there is?” Output isn’t even worth measuring, but it’s there. I installed a homemade power panel right by the ladder into the loft. It consists of a volt and ammeter for each device (including the solar panels) and stop switches for the wind generators plus a cut-off switch for the solar end of things. The gauges allow me to monitor the instantaneous voltage and current output of each device as well as the state of my batteries. 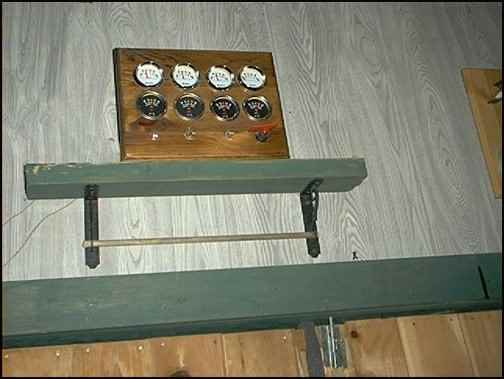 The stop switches are designed so that I can shut down a generator in case of high damaging winds or for maintenance. The gauges are an automotive item and come equipped with a small bulb that, when I switch it on, acts as a convenient night-light. 10 to 15 mph wind is typical here where I live and it’s a rare day when I don’t get any wind in this regime. Now, the Air-X’s harmonize pretty well, taking turns dominating the wind song as they increase and decrease in speed quite regularly. Hardly ever do they spin continuously in this band. But when they do, it’s pleasant. The sound is now above a whisper, more like moving wind through the tops of trees in the summer. Even at different speeds, hence, different pitch, they’re not discordant. It’s an ear-pleasing treat; a low-key tune that lulls and fades, rises again, then lulls and fades once more and so on, well into the night. It makes it easy to sleep, easy to forget that they are even there. Note: In this regime when both Air-X’s cycle up and down in a variable wind it produces an interesting whooing ghost-like sound. It could frighten a young’un at first. Filling in the bottom end is the Mallard. It’s awake now and has taken over the bass cello seat in the orchestra. Still, there’s too little wind to keep it performing with any regularity. Nevertheless, when it plays, the Mallard “Ace Bass”, adds a peculiar depth to the wind-song lullaby. Output: The LEDs on the Air-X’s are lit up as they spin. At the upper end of this band, the Air-X’s are putting out about 60-70 watts of power. I’ll see the ammeters on the gauges bounce around the 5-ampere tick mark. Not a lot of power, but who is going to throw it away? Ace Bass, the Mallard 800, is having problems moving his needle. I think he’s still getting dressed. The Air-X’s are mounted to a mast secured to a gable wall and extend 6 feet above the peak of the roof— one on each side of the roof (east and west). The Mallard is mounted the same way on the southwest corner on the lean-to addition and is shielded by the gambrel roof on the north side. It also is 6 feet above the roof. None are attached directly to the roof. 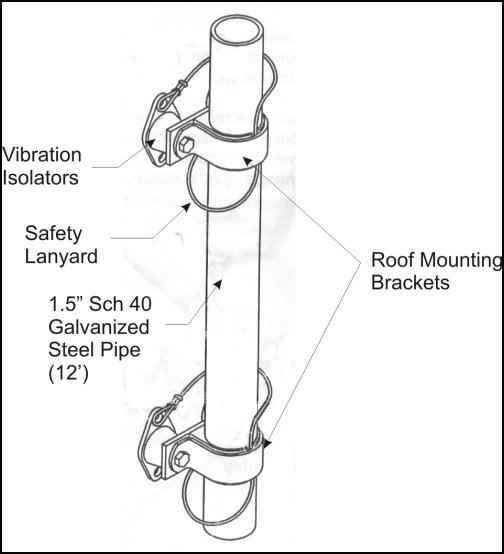 The standard roof-mount kit includes rubber vibration isolators that install between the mast and the structure. It’s a good idea to check the isolators each year as they are prone to crack and deteriorate. I do this, and I’ve never had my roof or any part of it helicopter itself into another place and time. The song gets interesting here. This is a powerful breeze. The deep, bearing-rumble from the Air-X’s are completely gone and replaced by a whine. The air sound is now a low howl as the foils slice through the wind. With eight times more power available in the wind at 15 mph than at startup, the units are much more active. Their aerodynamic bodies and short fish-like tails make them dance comically in and out of the wind. As a result, there’s a dramatic rise and fall in the dominating wind howl and an occasional solitary bearing thump if one yaws out of the slipstream. One will be spinning hard and I can hear the air madly rushing through, while its sister on the other end of the house, loses its wind, spins out and decelerates rapidly almost to silence. Meanwhile, the powerful sounding Mallard gets some wind, and he gears up smoothly. Initially it sounds like a large fan pushing air around. But quickly, the fan sound is replaced with what sounds to me like a well-tuned sewing machine. A big one. One on steroids…a 16 cylinder Bernina affixed to the top of a ’71 Porsche 917 Short-Tail rocketing out of turn 8 and about to accelerate home. No howling, less prone to rapid acceleration and deceleration or falling out of the wind, the big green sewing machine is getting ready to breathe some fire! When all three are spinning it makes an interesting, continuously varying, wind-song with hardly any repeat measures in the composition. It’s moved beyond a lullaby, beyond a subdued symphony, now its more like a fast-paced jazz ensemble, free-wheeling and making it’s own rules. The not-so-faint bass sounds from the Mallard fill out, maybe even temper the more active, driving sounds from the Air-X’s. Output: Power output is developing quite well now. The Air-X’s are producing much more power than the Mallard. I see about 12 amps being fed to the batteries from each Air-X and of course, much more from the frequent sudden gusts. The Mallard lags noticeably in the power curve. I’ll see about 4-7 amps from the big green sewing machine. Roof-mounting has some drawbacks performance-wise. Friction causes air to move slower around an object. Wind shear results in a wind velocity profile where the velocity increases according to a 1/7th power law from the ground upward. What this means is air close to the ground (or the roof) moves much slower than 30 feet above it. The net result is that there’s less energy captured by a roof-mounted generator because out of necessity, it is much closer to the effective ground (the roof) than a tower-mounted unit would be. Add to that thermal effects that create a strong eddy effect in the air confronting (and immediately behind) a spinning rotor. As moving air picks up heat from a hot roof the smooth flowing streamlines break down into chaotic eddies that can adversely affect the directional stability of the wind generator. This is one reason the Air-X’s spin themselves out of the wind for no apparent reason. At the onset of turbulence the gennys will give the visual impression they are “hunting” for wind. The roof is alive now. This is my favorite part of the spectrum. There is hardly a break for the orchestra. The Musician’s Union is having a cow! There’s always at least one genny spinning, more often, all three; each competing for center stage. Strong gusts are frequent and accelerate the rotors vigorously. This is power! The Air-X’s are howling, working hard, almost non-stop. The short-bladed gennys spin furiously now, I can’t even see the blades. They seem to be most comfortable at this speed and they perform better than I expect. The bearing whine has peaked out, but it’s hard to say for sure, as it is overpowered by the rising voice of the wind-howl. They are a little less likely to lose the wind at this speed but when they do, it’s dramatic. As the sleek body spins out, the rotor rapidly loses energy and the blades decelerate. It’s eerie, it seems like the Air-X wind-howl shouts itself to an instantaneous whisper…sound manifests where there is no sound! My best guess is that the human brain, in order to compensate for the abrupt stimulus change, invents a sound to deal with the void. In any event, the void doesn’t last long for as soon as the unit spins out, its own momentum carries it around in a full circle smacking it right back into the wind. The rotor instantly responds and accelerates wildly and the music continues. Watching, listening, feeling the Air-X’s action, I imagine a sleek, high-spirited Arabian running at a full gallop . . . head down, mane plastered back, firing across a meadow with her large black eyes ablaze with fury. She’s running for no other reason than that she smells the wind, and because that’s what she’s bred to do. Meanwhile, on the southwest side, the big green Mallard gets a five-foot armful of air and responds to the challenge. The previous sewing machine hum breaks off and transforms seamlessly into a growl. Now the air pushing through the blades sounds like the fan on a big American-made, early 70’s, V-8 Cadillac with 10 times more air flow passing through. Smooth, powerful, surprisingly responsive, it feels like he has power to throw away. Output: Power output is fine in this regime. The Air-X’s are pumping out a little over 300 watts each when steady. That’s feeding in 25 amps or so per unit. The Mallard, the big green Cadillac, still lags behind at around 15 amps at best. Odd, because it just sounds so powerful! To put things in perspective, we’re not talking about huge amounts of power here. The Air-X’s, under the right (but rare) conditions, will over-power and produce a maximum of 550 watts each, the Mallard is rated at 800 watts and may actually put out more. Combined, the power output is way shy of 2 kw. But, the wind doesn’t blow constantly and when it does it is a variable resource. A single wind generator or a small wind farm is a great way to get started in the energy production arena. Depending on the setup, this could easily power a single room with lights, a modest amount of computer time, TV and a few other goodies in turn. 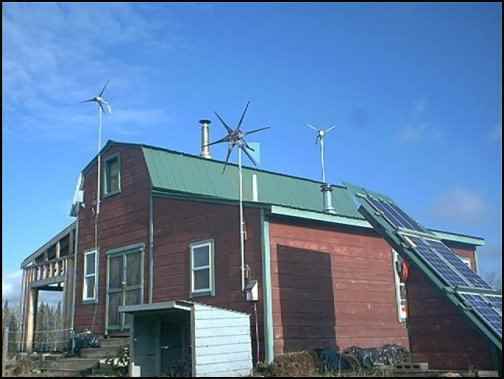 A single room powered only from alternative energy sources while the rest of the house is still grid tied not only works to reduce the monthly bill, but also begins the mental and lifestyle adjustment toward conservation that is crucial to the successful deployment of a non-fossil fuel or nuclear based society. We’re on fire now! There’s a big whopping difference in the energy available in the wind from 25 to 35 mph. The wind itself is howling now and the Air-X’s howl right back at it not giving an inch except when they get thrown out of the stream. A lot is going on inside the genny’s at this speed. It’s like the brain telling the body, “Eat any more of that double chocolate fudge cake and I’ll make sure you regret it!” I don’t always listen, neither do the Air-X’s. In principle, the Air-X’s max out at around 28 mph and their brains, the micro-controllers, attempt to slow the rotor down. Output power, as a consequence gets throttled back. But the blades are furious. As fast as today’s electronic feedback circuitry is, it can’t always keep up with the wind, and with a good strong gust, the blades often accelerate way past the pre-programmed shut-down speed. I n addition, the body has difficulty in maintaining a stable heading in the fierce winds and it oscillates slightly about its vertical axis as it gets buffeted by the turbulent slipstream on the downside of the foil. You can see it happen as it wiggles and shudders, occasionally letting go and spinning right out of the wind with a howling sigh. In this wind regime, I start to get tense. I can’t tell if it’s excitement or anxiety – they seem sometimes to be one and the same. At the upper end, the Air-X’s are wild. I feel the dawn of a strange uneasiness about to unfold. Now, they are running like a thoroughbred, ears pinned back, nostrils distended as if snorting the smoke from an unseen fire. The Air-X’s are fighting to hold their space in the wind. The dual howls combine to produce a soundtrack that could easily accompany the climax of a Hollywood thriller-chiller. Intensity builds and builds, the excitement is almost too much to handle, and with one last furious gust of air… just as Jack Nicholson breaks the window and is about to say “Heeeere’s Johnny!”, just as the east side Air-X aligns it self back in the wind… just as…no, no, a thousand times no…FLUTTER! Egad! The first time you hear a carbon-fiber composite blade go into a flutter state you’ll get goose-bumps. All over! It’s like a door being unexpectedly slammed right in your face. It only occurs for a brief few seconds and usually in a sequence of two or three blasts separated by a second or so. When we were kids, we used to shove balloons into the rear spokes of our bicycle and peddle like Satan himself was chasing us. If you can recall that auditory delight and multiply it a hundred, you have some idea what flutter sounds like. The sudden onset, the quick shift from a fast moving aria to the auditory chaos of flutter, makes this a most objectionable sound. You can bet this will wake you up. It may even resurrect the recent dead. For the brief second or two that it lives, it imparts a sense of self-destruction. But not to fear: Flutter was actually a designed-in safety feature of early Air-X’s to limit the rotational speed of the unit. It does a marvelous job at hauling down the speed of the rotor, but at the cost of a highly unpleasant auditory experience. Meanwhile, the race gets hot. The big green Mallard is like a buffalo in a storm. It points its head rock steady into the wind and does what it is programmed to do. The buffalo survive, the Mallard generates electricity. The massive blades gulp the howling air and do so quite easily. A slight struggle arises as the wide sheet-metal tail-vane momentarily fights to stay in the wind. It wins the battle and the rotor spins until the wind gives up. The Mallard is very comfortable at this speed and wouldn’t mind seeing it on a more constant basis. Output: Power output is as good as it gets. Twin Air-X’s are outputting 400 watts each, occasionally stretching their limits to 550 watts in brief gusts. The ammeters are pegged at 30 amps, real world amperage might be around 45 amps. Voltage is pretty well controlled at 14.7 volts or slightly less. The Mallard, the shaggy monarch on the southwest roof, is starting to shine. Still well below the Air-X output, it’s generating 15-20 amps at the high end of this wind band at about 14 volts. Although a microprocessor controls the voltage output of the Air-X’s, the Mallard will continuously feed electrons to the battery as long as its voltage is above battery voltage. It cares not one bit about what is going on inside the Air-X. Could be, I begin to think, this beast needs some control. The Air-X units have an integral charge controller inside the fish-like body. It senses the voltage on the batteries and limits its output to avoid overcharging them. It is user adjustable within a narrow range. The Mallard is an uncontrolled device. If the voltage generated in the unit is higher than the battery voltage, it charges the batteries whether they like it or not. Overcharging batteries can cause damage and produce hydrogen gas in the process. One type of external charge controller often used to regulate uncontrolled sources is a diversion load controller or dump load controller. It is placed on the battery bank and when the batteries are full, it diverts the excess charge to an electronic bottomless pit like a hot water heater. When the battery voltage falls again to some percentage below full charge, the diversion load shuts off and battery charging resumes. I have one of these, I just haven’t installed it yet. The Air-X’s continue to spin wildly; howling and occasionally screaming at the wind. Up and down they accelerate; both are in a constant frenzy. One will spin out of the wind, decelerate rapidly then charge right back into the wind for more. This is excitement! But things deteriorate rapidly. A quick flutter on the west side, east side holds into the wind then spins out. Peace rushes in but only for 30 seconds and then the fury resumes. At the upper end, they seem to spend too much effort in fighting the wind, and it appears that they are losing the game and being battered unnecessarily. Out of mercy, I’ll throw the stop switch – they’ll fight the wind again some other time. For the Air-X, the battle is over, the wind has won. Faithful, hard-working, robust, it is all that I could ask for in a small wind generator. The Mallard, still a magnitude quieter than the Air-X’s, has plenty of fight left. I can see and hear the tail-vane occasionally shudder as a gust of wind tries to take it from the side and knock it out of the wind. The gust fails and only serves to spin the rotor faster. All six blades are moving so fast I can’t see them anymore. Striking back at the wind like Hell hits the sinful, the Mallard searches for, and hunts down the wind. The sound is like 1000 . . . no, 2000 Tibetan monks simultaneously chanting “OMMMMM” into a microphone with no pause for breathe, just a long continuous chant until the wind gives in. Oh, what a glorious battle! This! This is how electricity should be made! Output: With the Air-X’s shut down, power output is left up to the Mallard, the fighting monk. Output is around 20-30 amps with uncontrolled voltage that may temporarily exceed 17 volts. While the batteries will accept the high voltage especially if they are in need of charging, the AC inverter that converts battery DC voltage to 115 VAC complains. Above 17 volts the inverter shuts down the AC side of my electrical system and I have a momentary brownout for having too much power! Stand back! This could be the end of us all! The Air-X’s are out of the picture now. Like Davy Crockett left standing alone at the Alamo, the big green Mallard is on its own to defend the roof against a menacing 50 mph wind. It could be that it is at the peak of its endurance, but then again, maybe not. “Bring it on, you dirty sons -of-Satan!” the Mallard taunts the wind. A strong gust suddenly attacks off to the right in an attempt to spin the machine out of the wind and kill it. The big, green, sheet-metal vane shudders slightly and the Mallard quickly flicks its head to capture the gust, accelerate, and almost immediately face back to the prevailing west wind for more. Thump, thump, thump. The mast starts vibrating above the top mount making contact with the trim across the lean-to roof. Uh-oh! Could this be the weak link, the Achilles heel that brings the big green Mallard, the king of the wild frontier, to its knees? Another slight ripple across the tail-vane, but this time the Mallard stays facing the wind, blades spinning furiously and roaring back at the howling wind. By God, I think, he’s actually enjoying the battle! Another side thrust from a gust is handled. Its energy captured but followed by some turbulence that causes the tail-vane to oscillate left and right a couple of inches each way and a brief struggle to maintain stability ensues. But the long pitch from the center mount to the tail mount results in less than a half inch variation in the rotor direction so the Mallard has no trouble in regaining its footing. No flutter, no hunting for the wind, just head-on, rock-solid stability. No, I’m convinced there’s more fight left in the big green Mallard. The energy in the wind scales with the cube of the wind speed. There’s almost twice as much energy blasting through the Mallard at 55 as there was at 45 mph. But I don’t think Ace Bass cares; he’s in the fray until God calls him home… or the 50 amp fuse blows and it may be close to 50 amps now, I don’t know, but the wires are warm. This is my kind of wind machine! Years ago I lost hateful Hilda because I was a fool and didn’t act. I’m wiser now, age does that sometimes. So I throw closed the stop switch. I guess I’ll never know the Mallard’s limits. But I’ll sleep tonight and dream about it.